Bernice kitty poses next to the decorative autumn display at Animal Hospital of Oshkosh, making for our new favorite fall season cat pic. There are positive updates on her progress, too. This is now our all time favorite autumn themed cat photo. Those readers who follow Bernice’s progress closely at Animal Hospital of Oshkosh’s Facebook page may have seen it when it was posted earlier this week. It features the cat who represents hope for survival against all odds, and recovery from injustice and injury; and she’s looking absolutely great. Hi Everyone! I spent a fun filled long weekend at Dyan’s house she has been helping to take care of me since I came to the clinic, I’m so lucky that I get to go on vacation every weekend, plus I get spoiled! Today while I was running around the clinic I went to check out all the fall decorations and pumpkins, the dried corn was my favorite!! It made lots of noise, and was really fun to play with!! Big week for me, my surgeon is coming from Madison to see me again on Wednesday and going to try to remove some more scar tissue! I will keep everyone up to date as soon as Im feeling better. 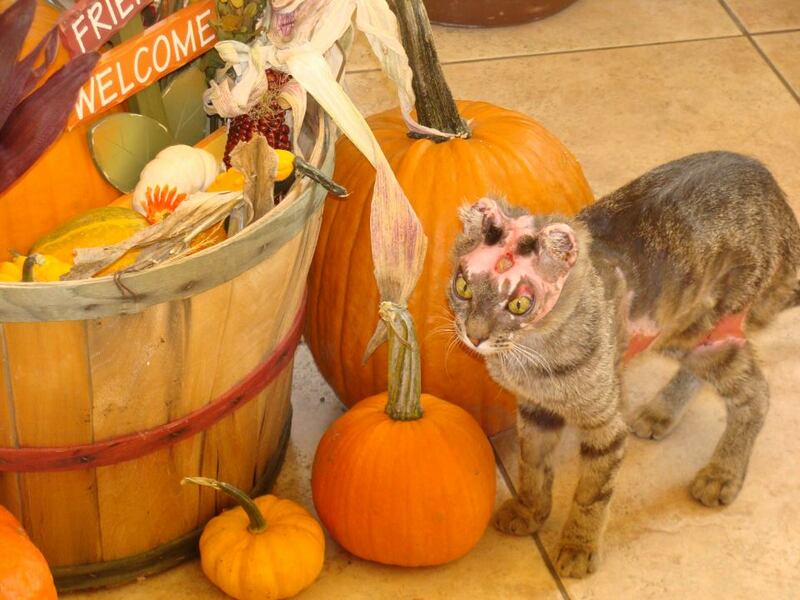 The cat who was found severely burned on the street in Oshkosh WI one day last summer, and who was given the chance to live and recover as her loving and determined nature shone through, has made a remarkable recovery. As a severely injured stray with very questionable chances for survival, she may not have been given that chance. Thanks to Animal Hospital of Oshkosh, she was. A recent surgery to replace scar tissue with supple and stretchy skin was successful and gave Bernice greater mobility and ease of movement. It also benefited her cosmetically, helping her to look more greatly normal and healed. A second surgery to do the same for her back end was performed on Wednesday of this week. The surgery on her back end went well, and included some work on her head. The skin on Bernice’s head was loosened somewhat to try to close the open spot that is so apparent when we look at her. The tight tissue on Bernice’s left rear was removed to give yet greater mobility. A skin graft will follow two weeks after the surgery. The difference between the damaged creature wrapped like a little mummy and clinging to life and the healthy, happy cat of today is nothing short of amazing. Go Bernice! Yay for Bernice the kitty! So glad that she continues to keep doing better with each passing day. Thats Bernice,she will triumph over all this.She has made such amazing progress i just adore her every time i see her picture it makes me smile,LOVE LOVE LOVE BERNICE.